Last November’s elections had cannabis on the ballot in four states: Michigan, Missouri, North Dakota, and Michigan. North Dakota and Michigan residents were voting about passing recreational cannabis laws, while Missouri and Utah voted about allowing medical cannabis. North Dakota had an ambitious program planned for its recreational laws, and North Dakotans decided to pass on allowing recreational marijuana in their state—at least for now. The remaining three states, however, now have legal cannabis in various capacities. Let’s take a look at how new cannabis laws will impact the new legal states. The state of Missouri had three medical marijuana measures on its ballot, and one of them—the least restrictive of the three—passed. Thanks largely to efforts of the Marijuana Policy Project (MPP), Amendment 2, a state constitutional amendment to allow medical marijuana, passed by a margin of 66% to 34%, and Missourians received the green light for medical marijuana. Amendment 2’s medical marijuana policies are not as restrictive as those in some other medical states. Under a doctor’s recommendation, Missouri residents can gain access to medical marijuana for any health condition the referring doctor deems appropriate. This is different from several others medical states that require marijuana patients be afflicted with one of the ailments on a list of qualifying conditions. Under Missouri’s new law, qualifying patients will receive identification cards from the state, and they and their caregivers can grow up to six cannabis plants. These patients can also purchase up to 4 ounces of cannabis per month from a dispensary licensed by the state. The state will also issue licenses for cultivation, testing, and infused-product manufacturing businesses. A 4% retail tax will be in place for medical marijuana product sales. The revenue earned from these taxes will go toward services for military veterans. Now to the two ballot measures that didn’t pass. The first, Amendment 3, would have required medical doctors to provide medical marijuana recommendations to patients only if patients qualified under a specific list of health conditions. Amendment 3 would not have allowed home cultivation for medical purposes. Under Amendment 3, cannabis retail sales taxes would have been a lofty 15%. The tax revenue would have been put to use for research aimed at cures for chronic, potentially fatal diseases like cancer. This measure failed, with a voter margin of 31% to 69%. The second failed ballot measure, Proposition C, was a proposed statutory change. Proposition C would have levied a 2% tax on medical cannabis sales and allowed for recommendations for a specific list of qualifying conditions. This ballot measure failed by a margin of 56% to 44%. Missourians made their votes count by passing the least restrictive of the three ballot measures, providing important access to medical marijuana for patients in need. The Marijuana Policy Project campaigned hard for reasonable cannabis law reform and looks forward to the day when the federal government addresses cannabis on a national level. The state of Utah was the second state to pass medical marijuana measures on its November ballot—but by a much closer margin than Missouri. The passage of marijuana reform laws in Utah was a particularly controversial topic. Fortunately for medical marijuana patients, opponents and proponents of the medical marijuana came together to draft compromise legislation. Under the bargain struck by these two groups, Utah’s medical marijuana patients will soon have access to cannabis for medical purposes. Utah’s Proposition 2 measure passed by a margin of 53% to 47%. Regardless of a compromise deal, Utah’s medical marijuana laws are among the most restrictive in the country. First, a person must have epilepsy that’s diagnosed by a licensed neurologist who recommends medical marijuana for the patient after other therapeutic measures have failed. Smoking medical cannabis is out. Ditto for growing it—except under the most extreme circumstances. A patient must live more than 100 miles from a dispensary in order to grow it—but not smoke it—and that law will not go into effect until 2021. Under Utah’s recently drafted legislation, the therapeutic use of cannabis is limited to hemp CBD. The product must contain at least 5% CBD and less than 0.3 THC, and it cannot contain any other psychoactive ingredients. Patients must obtain a Hemp Extract Registration Card at a cost of $200 per year. Patients suffering from life-threatening diseases like cancer will not have access to the plant. In stark contrast to Utah, Michigan passed cannabis recreational legislation that is among the most liberal allowed in the United States recreational marijuana states. Under Michigan law that went into effect on December 6, 2018, Michigan residents who are 21 years of age or older may consume cannabis in their private residences or those of friends. Public use is forbidden. Dispensaries in Michigan will not be open for business until 2020, but the state will accept dispensary applications through nearly all of 2019. Until dispensaries open for business, Michiganders may grow up to 12 plants at home—which is more than other recreational states allow if there is only one person 21 years of age or older living at the residence. When dispensary sales begin, adults 21 and older may purchase up to 2.5 ounces—which is quite a bit of marijuana. Most other recreational marijuana states limit sales and possession to 1 ounce. Until dispensaries open, adults in Michigan may possess up to 2.5 ounces of cannabis without risk of legal consequences. Michigan’s new cannabis laws have some citizens concerned that it’s too much too fast. Cannabis proponents in the state have crowed that Michigan is now “the cannabis capitol of the Midwest,” which is not a status all Michiganders think is a good thing. Michigan’s southern neighbor, Ohio, has recreational marijuana on its ballot in 2015, but it was resoundingly rejected. Persistence may pay off, however, because the Buckeye State may have the Ohio Marijuana Legalization Initiative on its ballot as an initiated state constitutional amendment in November 2019. This will allow Ohioans to once again decide of the legal use, possession, and sale of marijuana to adults 21 and older is right for their state. Until that time, Michigan will remain the Midwest’s only legal recreational cannabis state. Other than Ohio’s legal medical marijuana status, two other Michigan neighbor states, Indiana and Wisconsin, have full marijuana prohibition laws in place. Colorado, Washington, California, Oregon, Nevada, Massachusetts, Vermont, Maine, Michigan, and Alaska, as well as the District of Columbia, now allow the recreational use of cannabis for adults 21 years of age and older. Medical marijuana programs are also in place. 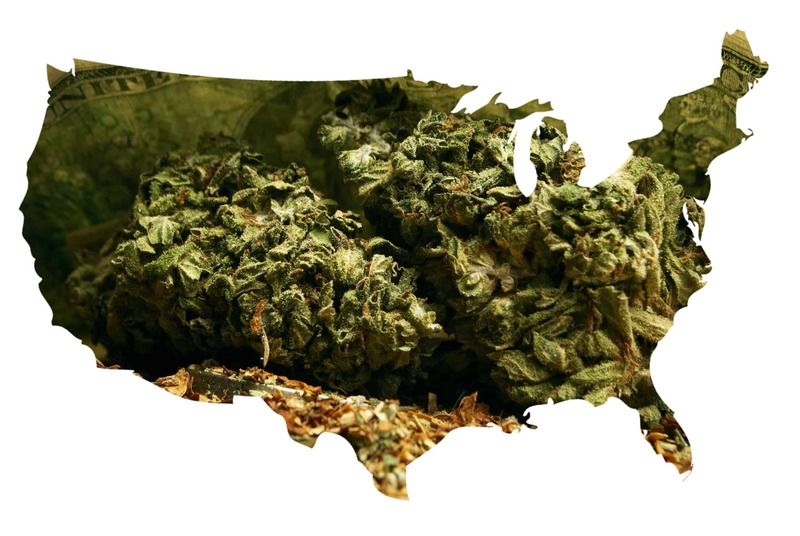 Montana, Arizona, Utah, North Dakota, Minnesota, Oklahoma, Missouri, Illinois, Arkansas, Louisiana, Florida, Ohio, West Virginia, Pennsylvania, New York, Maryland, Delaware, New Hampshire, New Jersey, Connecticut, and Rhode Island allow the use of medical marijuana in various capacities. With recreational cannabis now legal in 10 states and the District of Columbia, and medical marijuana laws on the books in 32 states, the remaining states that completely prohibit the use of cannabis face a landslide of legal-cannabis-use laws that are sweeping the nation. Each year, prohibition states consider implementing their own laws regarding cannabis. An increase in the legal status of cannabis in other states seems inevitable, but which states those will be—and when—remains to be seen.